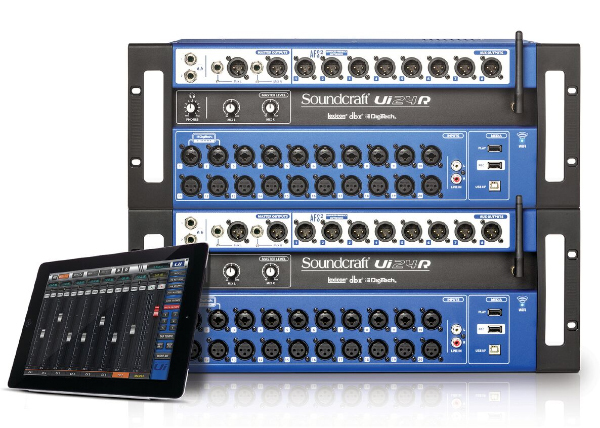 HARMAN Professional Solutions has debuted a significant free update to the Soundcraft Ui24R surfaceless mixer and multitrack digital recorder. •	Cascading: It enables users to connect two Ui24R via Ethernet to double their mixing capability by enabling a new 32x32 bi-directional audio bus between consoles. Users can easily switch between Host and Remote units with a single click on Ui24R’s HTML5 screen user interface. Common applications of this new functionality include: doubling mic inputs, by adding a second Ui24R as a submixer, routed into the main Ui24R; and utilizing two Ui24R mixers to create two fully independent mixes, each with dedicated EQ/Gate/Compression, for example when mixing FOH and monitors, or creating independent FOH and streaming/live recording mixes. •	Cue Recall: Ui24R’s new Cue feature enables the saving and fast recall of mix settings. While recalling Cues, Ui24R can block any changes to routing or processor types, which enables seamless operation, an essential during low volume events, for example while mixing for theater. •	UDP Lighting Control: A new UDP view in the Ui24R HTML 5 interface adds simple buttons to send industry-standard UDP commands over Ethernet to external gear such as lighting software or hardware lighting controllers. A valuable use for this feature is to trigger pre-set lighting cues, which is perfect for community theaters, churches or corporate presentation settings where the sound engineers or volunteers might not have lighting experience. •	Lexicon Reverb PreDelay: The embedded Lexicon processing in Ui24R is now enhanced with Reverb Pre-Delay, allowing users to easily set the time before first surface reflections and more quickly simulate desired acoustic environments. •	Big Desktop: The new “Big Desktop” INFO view adds provides a birds eye view of the entire Ui24R mix environment, represented as a single large console surface. Users can see graphics of their gate, compressor, EQ curve, FX and Aux sends, and jump between controls for editing with simple double-clicks. This feature is designed for use on 1080p resolutions screens. •	Expanded Touch Screen Support : Users now have more options for touchscreen control of Ui24R with more than 25 leading touchscreens, which directly connect to the Ui24R via HDMI and USB.